PITTSFIELD — Has any composer in the history of musical theater ever achieved the kind of back-to-back artistic triumphs in a two-year span that Stephen Sondheim pulled off with “Company’’ in 1970 and “Follies’’ in 1971? Sondheim was at the peak of his lyric-writing and compositional powers in that era, and a good thing, too, because both of those successive masterpieces are nearly devoid of story or plot in any traditional sense (unlike, say, the musical with which he would eventually close out the 1970s, “Sweeney Todd’’). Indeed, George Furth’s script for “Company’’ is so flaccid and the show’s connective tissue is so attenuated that today it registers as essentially a song cycle. Ah, but what songs they are, and what pleasure they continue to give nearly five decades later, and what vigor and brio director Julianne Boyd brings to her vibrant production of “Company’’ at Barrington Stage Company. Aaron Tveit, who played Danny Zuko in TV’s “Grease: Live’’ and starred on Broadway in “Next to Normal’’ and the musical adaptation of “Catch Me If You Can,’’ portrays Bobby, a commitment-averse bachelor who is wondering, as he turns 35, whether it’s time for him to finally settle down and get married. His married friends are eager to offer him advice on that score, although their messages — both spoken and in terms of lived example — are abundantly mixed. Indeed, the friends are in some ways as lost as Bobby is. An undercurrent running through this “Company,’’ which is set in New York City in 1970, is how discombobulating it was for not-quite-young people at that time and place as they inhaled the heady aroma of the counterculture and were suddenly presented with a social freedom they didn’t quite know what to do with. 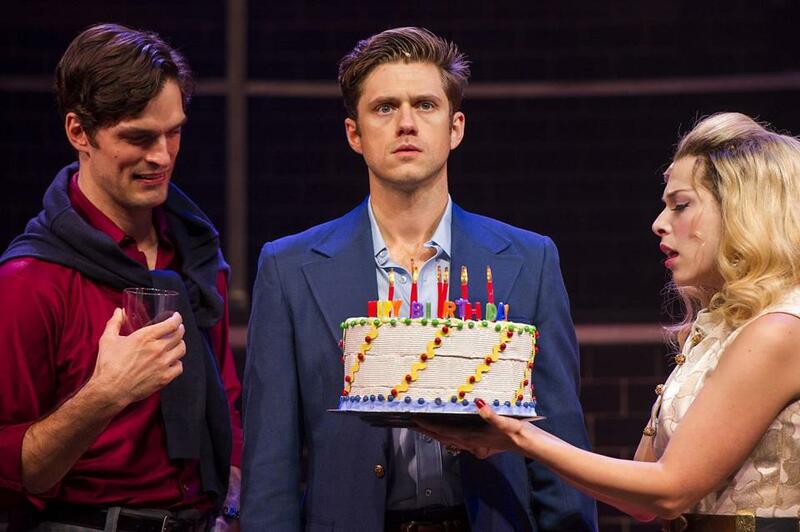 If anything, the Barrington Stage production further emphasizes Bobby’s apartness; while the rest of the cast are attired in garish ’70s clothes (the costume design is by Sara Jean Tosetti), Tveit wears a tastefully understated blue jacket that would not look out of place in 2017. That apartness means that an actor playing Bobby can seem remote or passive, and Tveit does not entirely avoid that trap. His Bobby is urbane, enigmatic, bemused, sometimes amused, sometimes amusing, but he does not come across as terribly conflicted. Except, crucially, in song. There, Tveit shines. He powerfully nails the yearning in Bobby’s solo “Someone is Waiting,’’ and he captures his character’s confusion and ambivalence in “Marry Me a Little,’’ in which Bobby insists he’s ready for marriage while stipulating rigid conditions that suggest he’s not at all ready. In the climactic “Being Alive,’’ Tveit passionately conveys the liberation achieved, paradoxically, when a gregarious loner like Bobby finally surrenders, unconditionally, to his need for another person. Boyd, who has also helmed productions of “Sweeney Todd,’’ “A Little Night Music,’’ and “Follies,’’ has filled out her “Company’’ cast with other strong voices, which is mostly a plus, except in a couple of numbers when the singers perform less as a unit than as a collection of soloists. Throughout the show, the director makes dexterous use of Kristen Robinson’s sleek, multi-level set. Lawrence Street, James Ludwig, and Peter Reardon are a poignant team on “Sorry/Grateful,’’ a brilliantly insightful song about the joys and trade-offs of marriage. That trio, along with Paul Schaefer and Joseph Spieldenner, leer entertainingly in “Have I Got a Girl for You,’’ but the song ends too soon, as if Sondheim was in a hurry to get to the next one. No actress who plays the aging socialite Joanne will ever fully escape Elaine Stritch’s long shadow, but Ellen Harvey captures Joanne’s scorn and self-loathing, especially in her bitterly uncompromising rendition of “The Ladies Who Lunch.’’ Rebecca Kuznick, Mara Davi, and Nora Schell team up winningly on “You Could Drive a Person Crazy,’’ a peppy, Andrews Sisters-style number in which the frustrated women in Bobby’s life unload on him. Davi makes for a touchingly naïve April, and her duet on “Barcelona’’ with Tveit is lovely, but the depiction of the flight attendant (who went to Northwestern, no less) as a dim bulb is a grating cliché. At moments like that, “Company’’ can seem awfully dated. But it’s much more often the case that the Barrington Stage production reminds us how timeless Sondheim’s score — and his wisdom — remain.